Facts about Fiordland Penguins. "Scientific name for Fiordland Penguin is Eudyptes pachyrhynchus". The Fiordland Penguin lives in rainforests of Southwest Coast of Stewart Island and Southwest Coast in New Zealand. The population is around 3000 pairs and this is because it has so many predators. The Fiordland Penguin are active at night and not so much during the day, this also helps to stay safe from predators. These predators include, rats, dogs, stoats (Weasel) and cats. The Fiordland Penguin communicates by using a barking like sound when out at sea, and by vocal sounds and visual while on land. 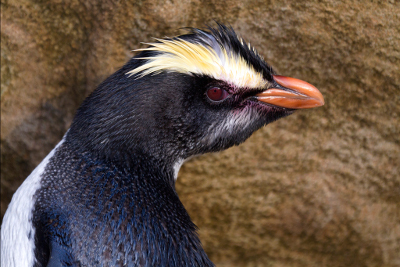 Fiordland Penguin looks more like the Snares Penguin with the yellow strip that runs above the eye and ending in a drooping plume. The only difference is that Fiordland penguin is large, has white streaks on the cheeks and it does not have a fleshy margin at the base of the bill. That’s what differentiates it from the snares penguin. Fiordland Penguins are medium sized Penguin being approximately 23 1/2 inches (60 cm) in height and weighing between 7 to 9 lbs (3.2 to 4 kg). .
Not much is known about the diet but it is believed that Fiordland penguin feed inshore during breeding season. The Fiordland Penguin feed on krill, fish and squid. Fiordland penguin don't drink water, since they take in seawater as they swallow their meal and like all penguins, they have a that special gland that removes salt from their bodies after swallowing saltwater. The male Fiordland Penguin is the one that goes to the breeding area, before the female which follows after. The breeding starts in mid June and it is usually at the previous nests from the prior breeding season. The eggs are laid in July but the second egg is the one that hatches. The incubation period is 30 to 36 days. In case the first egg that for the Fiordland Penguin is normally smaller that doesn't usually hatch, but sometimes does hatch and the chick is small and usually dies afterwards, because it is too weak to compete for the food. Fiordland Penguins breed under high rainforest canopy, under boulders in dense shrubs and caves. The nests are made with twigs and grass. The colonies consist of loose groups and nests are always yards (meters) apart. The first few weeks the chick is guarded by the male Fiordland Penguin whereas the female feeds itself. But after some time both parents takes the responsibility of feeding the chick whereas the chick wonders around with other chicks and returning later to be fed. After the Fiordland Penguin chick is 10 weeks old which is around November it fledges. It will return back to the home to the colony to breed at the age of five years. The immature Fiordland penguins have a Molting -(of an animal-shed old hair skin, or an old shell, to make way for a new growth that will occur, the adult birds were already molting into their winter shades of gray) white chin and the yellow supercillum is thin and dull. For these immature birds it is very hard to differentiate them from the Snares Penguin. "Scientific name for Penguin Sphenisciformes". The life span of the Fiordland Penguin is 15 to 20 years in the wild.